THE FOREFATHERS OF THE MAYANS SET SAIL FOR MESO-AMERICA. [Right: A beach in the Konkan, todays Maharashtra,India,a fleet of Tamil ships in, a beautiful white sand coastline raises anchor and sails south to what is now the large island nation of Ceylon (Sri Lanka). 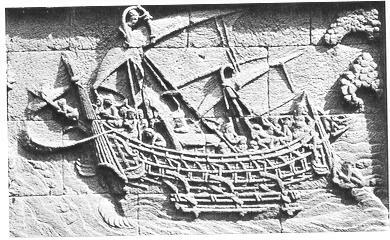 Their goal is to sail to Patala or what is now Mexico and America.During their stay in Ceylon, they started building temple builders in the province of Maya, to build a new Tamil civilization over or alongside an Akkad-type (Sumerian) civilization that was already in Meso-America: that of the Olmecs or Olman. The ancient Tamils were international traders and colonizers. Wherever they went in the world, they left an unmistakable imprint of their presence, such as place names, foods, games, and temple buildings. Their temple buildings were usually zikharis (tiered or pyramidical temple platforms). It means Phoenicians and Aryans were the same people. The Phoenicians in the Middle East eventually lost their awareness of being Dravidians, separating themselves in many small city coastal states. Even today, the Turkish peoples call themselves Ari. The forefathers of the Turkish peoples also called themselves Pancha (Five) Krishtayas (The Original Five Races of Mankind). Phoenicians as being a disorganized collection of city states, but as a single political entity spreading from Anatolia (Turkey) and Bulgaria to Greece ( one time a part of Phoenicia but later broke away). The Akkads (Sumerians) were Phoenicians. known also as Kads, Khatti, etc., Originally, they were a Turkish (Kur, Tur, Tul, Tol, etc.) people from what Bible calls Eden, the Akkadian word for the Steppes (Central Asia). Before the Great Flood, the Steppes or Eden was regarded as an earthly paradise. However, when the Great Flood inundated what are now the Altai, Tannu (Tiva, Teva, or Tuva), and Khakassia Turkish republics, the survivors had to build their civilization all over again. The Cologne Sanskrit Lexicon defines the Maya as mathematicians (measurers), astronomers, military strategists, magicians, wise-men, and builders. Mesoamerican Mayans definitely fit this description. Malati J. Shendge said that the Panis, Asuras, Yakshas, and Mayans were partners in a common cause. DNA EVIDENCE OF A SIBERIAN ORIGIN OF AMERICAN INDIANS. Russian scientists have recently discovered that the DNA of people from the Siberian Khakassia and Altai regions bordering on Tuva (also known as Tannu, Tiva and Teva). Russian scientists believe that the people of Tuva may have even a higher DNA match with Amerindians. All that is remaining now is to test the DNA of Mayans in other Asian lands, also that of our own Mayans, the Inca Nahua, Maya, and Mayo clans, as well as that of the Mexican Yaquis (Yakhs?) and Mayo (Maya)-two tribes speaking the same language. [Right: ArtistÃ­s idea of what the ancient Olmec city of La Venta looked like.] The Olmecs supposedly entered Western Mexico in boats, crossing the then navigable Isthmus of Tehuantepec. They first settled on the east coast of Veracruz by the river Papaloapan. The Nahuatl-speaking people couldnÃ­t pronounce Ã¬B.Ã® Papaloapan was probably Babalu-apan (Babylonian Crossing). The OlmecsÃ­ Zikhari (Temple Mounts) were similar to those of the Sumerian Zigurrats and with virtually the same name: Zicualli and Zacualli. Because the Nahuatl tribes couldnÃ­t say Ã¬L,Ã® it was probably a dialectical version of Zigurrat: Zicuari. 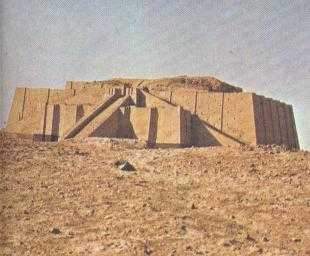 [Left: A central Asian Ziggurat with upper elevations eroded by centuries.] Hundreds of years after settling on the coast, they moved in to the central highlands of Mexico and as far northward as the present-day state of San Luis Potosi. Traces of them may eventually be found as far as Southwestern United States. Eventually, Nauvak changed to Anauwak (no longer ship people). Even today, the Nahuatl word Anahuac means Ã¬between two waters.Ã® The Nahuatl-speaking tribes also called themselves Toltec, derived from Toltika, meaning Ã¬Sons of Tulan or Turan.Ã® When the Spaniards arrived in Mexico, the Aztecs called them Ã¬Tules,Ã® thinking they, too, were Turks. Southern Persia, Afghanistan, and Pakistan had several different names: Sivapuri (The Region of God Shiva), Sivabhu (Sacred Land of Shiva), Sivapuni (The Purity of Shiva), and Shivulba (The Womb, Origin, or Cave of Shiva). The Pueblo Indians called their underworld or place of origin Sibapu or Sibapuni; for the Mayans, it was Shibalba, their “underworld” and place of the gods. The linguistic and functional similarities of the Hindu Sivabhu, Sivapuni, and Shivulba with the Puebloan Sibapu, Sivapuni, and the Mayan Shivalba (Xibalba) are too nearly exact to be coincidences. A Tepe was a low, steep hill surrounded by a village. The Tepe was used both as a fortress in case of attack and as a religious center honoring the villageÃ­s special deity-often a mother goddess. A few of the many hundreds of Tepes scattered over Sivabhu, even into the Middle East, are Tepe Yaya, Tepe Ya, Tepe Kilize, Tepe Liman, Tepe Catal, Tepe Godin, Tepe Cora, etc. Mexico is the only region outside the Middle East and Central Asia, where we find hundreds of these combination protective and holy hills called Tepes. Some of these are TepatitÂ·n, Tuxtepec, Tepec, Tepic, Mazatepec, Tepetatas, Tepantita, Tepetzintla, Tepuste, Tepetlix, Tepetlalco, ad infinitum. In ancient Sivabhu, the deities located at the tops of these tepes were called Yah, Yakh, Yakhu, Yaksha, Yakshi etc., meaning Ã¬Guardian Angel.Ã® The leading Mexican Yakshi (female guardian angel) had her sanctuary atop what is now Tepeyac (Hill of the Guardian Angel) in Mexico City. She is now the Virgin of Guadalupe. The map below-left shows Mt. 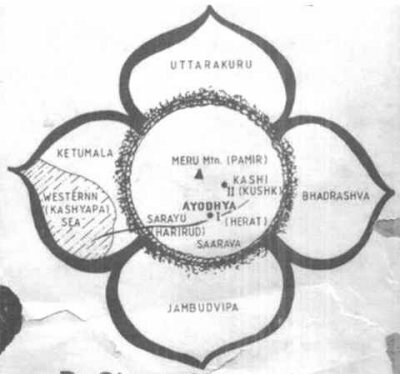 Meru with petals pointing in four directions. The left petal points toward a distant land called Ketumal or Chetumal. In order to reach that land, they had to go eastward in order to avoid sailing around the tip of Africa. They knew where they were going, for they had been there before! The map below-right was their own map of the world. The Mayans said that the land of their forefathers lay 150 days westward. When the Tamils arrived in North America, they crossed over to what is now the Caribbean Sea, through the Isthmus of Panama (The Great Crossing). After coming out the other side, they docked in the safe harbor of Chetumal. It still bears the same name. Chetumal harbor is in Belize. Belize derives from Belisha (God Shiva). [Right: Photo of Chetumal harbor in Belize. ]Later, they left Chetumal, sailing up the coast to a place reminding them of the beauty of their old home in Konkan. They dropped anchor and made their first home in America there. Not surprisingly, they decided to name their new home Kankun (Cancun). After thousands of years, the last syllable has barely changed in pronunciation. 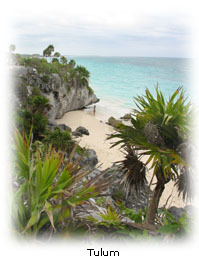 [Left: Beach scene in Tulum, Cancun area. 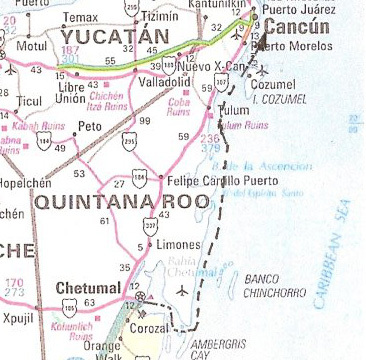 Right: Map showing their voyage from Chetumal to Cancun. 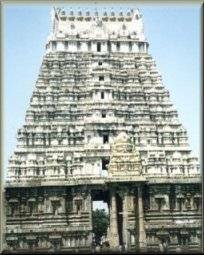 ]When the Tamils settled in YucatÂ·n, they built their typical zikharis, such as those of Tikal and Palenque. At Tikal, they stained their stone monuments a reddish color, just as they had done back in the Konkan. 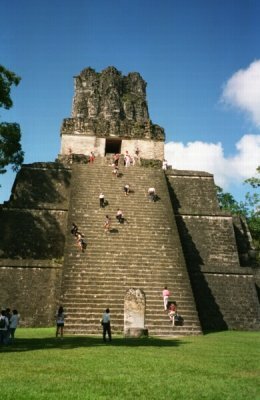 [Left: A Tikal Zikhari. Right: A Pelenque Zikhari. ]People are surprised to see stone images of elephants in Mayan country, such as the following one in Copan. It may be a reminder of the elephants in India. [Right: Stone etching of a Hindu mahout, complete with turban, riding on the head of an elephant.] Some authorities, who do not agree with me that the Mayans came from abroad, think Southern Mexico once had elephants. The truth is that they worshiped a long-nosed god (Chac) or elephant, just as the Hindu Tamils worshiped the elephant-headed Ganesha in India. Chak was the long-nosed Mayan God of thunder, lightning, rain, and crops. His elephantine trunk sprayed water on the earth. His equivalent in other parts of the world was Zeus, Dyaus, Jupiter, Ca, Jah, Ju, Jahve, Jehova Jeho, Sakh, Sagg, Sa-ga-ga, Sakko, Zagg, Zax. a.k.a. Zeus, is often depicted holding a serpentine thunderbolt and a grail, or someone is handing it to him. 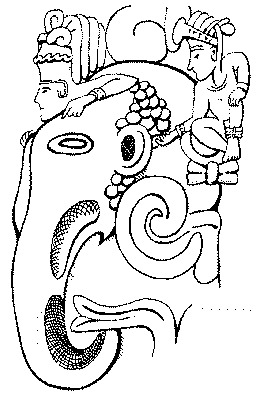 The Mayan Chak is equally depicted. LINGUISTIC EVIDENCE THAT THE MAYANS WERE FROM CEYLON. They gave several names that directly and indirectly identified Ceylon: Shilanka (Xilanca) – an ancient name of Ceylon (Zeilan-Ka). Shikalanka (Xicalanca) – Ceylon. In Tamil, Shikalam. Itzamna was one of their culture heroes. He claimed to have come from a western country. Isham, meaning ‘Tiger, “”Land of Gold,” was a Dravidian name of Ceylon. The Na in Isham-na is an honorific. 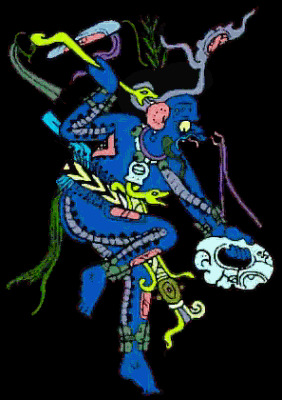 Ishbalanka (Xbalanca), another culture hero. 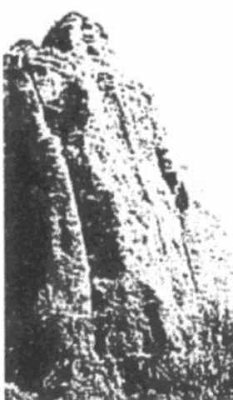 In Tamil, it means “Shiva of Lanka.” India’s God Shiva was supposed to have made the footprint on top of Adam’s Peak in today’s Sri Lanka. 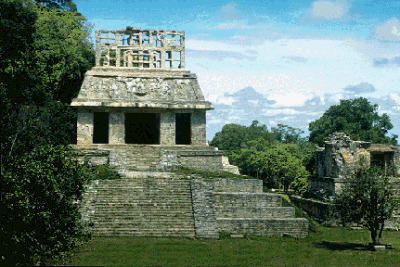 The Yaxilan (Yakshilan) Mayan ruins. This name means Ã¬The Ceylon YakhsÃ® in Sanskrit. THE THREE PROVINCES OF ANCIENT CEYLON. One of the names of Ceylon’s cult religions was Mayon. It still exists among a few aboriginals living on the island. Most of the Rakshasa and Pisaca bad boys were Tartarian Hunas, They came from Huna-Bhu, meaning Ã¬Hunas (Tartars) from the Sacred Land around Mt. Meru.Ã® Many of these tribes were cannibalistic, given to intertribal fighting, practitioners of human sacrifice in their religious rites, flattened the foreheads of their babies, took scalps in battle, and observed other customs attributed to many Amerindian tribes. The Mayans remember them as the culture hero, Hunapu (Huna-Bhu?). Guatemala derives from Sanskrit Guadhaamala, meaning Guha (Cosmic Intelligence) + Dha (Serpentine) + Amala (Umbilical Cord), the Sacred Umbilical Cord Linking Western Asia and India with Meso-America. Besides the Ceylonese and Tamil tribal names Yakkha, Maya, and Lak in Maya country, there are also the Lenca and Rama tribes. The Mayan lowlands are even called Guanacaste, meaning The Western Enlightened Nagas. It is assumed that the Olmecs spoke Nahuatl because of the place-names they left behind. The Olmecs called the Maya country in Southeastern Veracruz, Coatzacoalcos (Snake Sanctuary). Snake Sanctuary was none other than the home of the Western or American Nagas. Even today, the Mexican flag has an Eagle with a serpent in its mouth, representing the arrival of the ancient Mexicans to Meso-America. It also represents the arrival of the Meshika to what is now Mexico City. [Right: Mexican flag.] 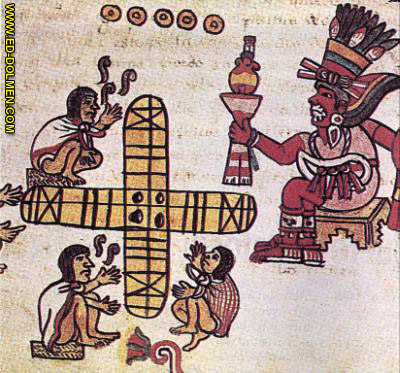 The Tamils and all the tribes of Meso-America, from Mexico to Panama, played the same board game: Pachesi. The Meso-Americans called it by a linguistically similar name: Patolli. (Note: CH and T are linguistically similar. LL was the only way the Renaissance Spaniards could approximate the sounds of Z and J. This proves that Patolli derived from Pachesi.) I myself saw a Patolli board game at the National Museum of Costa Rica, in San Jose. BOTH THE MEXICAN INDIANS & TAMILS ATE TAMALES WITH THE SAME NAME! The Tamils and Turks even gave some of their favorite dishes to the ancient Mexicans, and with the same names! I will name just two of them: Tamales and Corundas. 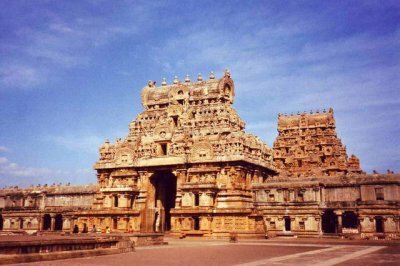 The ancient Tamils were known as Tamils or Tamals. One of their favorite foods was a type of paste or filling wrapped in bamboo husk. Even in Tamil Nadu it is called Tamal. The Michoacanos have a similar triangular shaped tamal called Corunda. In Turkic it would be kur-unda (Turkic dough). My Tamil Nadu friend, Mr. Subash Bose, pointed out to me the fact that Hindus often worship cobras and that the Mayans worshipped rattlesnakes. He said that Mayan huts look exactly like those in Tamil Nadu. The Kuberas even gave their name to North America. The Meso-Americans told the Spaniards that North America was Quivira (Land of the Khyber People). 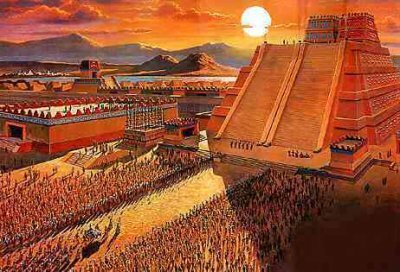 The Mayans called their Ã¬QuetzalcoatlÃ® Kukulcan and Gukumats. These names appear to derive directly from the Turkic language. Kuk or Gok derived from the Turkic Gog and Gok, names of ancient Turkish tribes. Ulu means Ã¬high placed.Ã® Mats derives from Masi, the Turkic word for Ã¬Messiah.Ã® Khan is a Turkic word for Ã¬King.Ã® Therefore, Kukulcan=Gogulkhan (The Revered King of Gog.) Gukumats=Gokumasi (The Revered Gok Messiah). 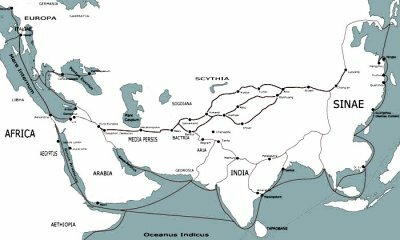 The presence of Dravidian, Turkic, and Sanskrit words in America shouldnÃ­t surprise anyone, for the Aryans and Indians (Ramanaka) traveled together throughout the world. In his book, El OrÃŒgen de los Indios, the Spanish priest, Gregorio PÃˆrez, wrote that the Caribbean Indians said that their founding fathers were the Kuru-Rumani. Some Dravidians think Sanskrit sprang from Dravidian, but it came before Tamil for sure as Veda were older than Tamilian language. Many of the Turks also spoke Aramaic, for at one time it was more generally spoken than it is now. Jesuit priest Francisco Xavier Clavigero wrote in Volume I of his Historia Antigua de Messico (Ancient History of Mexico). Clavigero said that the Chiapaneco Mayans told him that a grandson of Noah, Votan, took people to people America. He was from the Chan (Naga or Serpent) tribe. They said that he came from the East, bringing seven groups with him. Two other leaders (Groups?) had also previously brought in settlers: Igh and Imox. He built a great city, now known as Palenque, call Ã¬Nauchan,Ã® meaning City of the Serpents. When Noah emerged from the Ark, he and his people built their first city, calling it Nashan (The Noachide Chan). 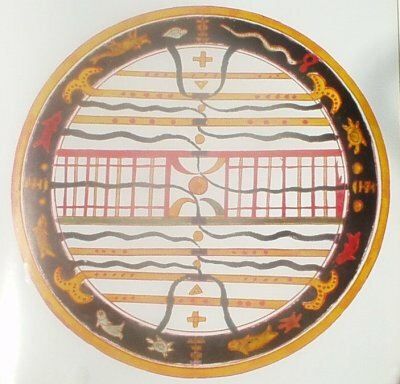 Votan founded three tributary monarchies called Tulan, Mayapan, and Chiquimala. The ruins of Tulan are those of Tula, Hidalgo, Mexico. Mayapan is the Yucatan peninsula itself. I have not yet located the region of Chiquimala. Perhaps it is Guatemala or the Mayan province of Tzequil. Notice the following map showing the sea and land routes of the ancient Tamils. Below it, youÃ­ll notice the words Oceanus Indicus (Indian Ocean). The ancient maps which the Spaniards used to get to America showed the same terms: Mar Indica; Oceanus Indica. From where did they obtain those maps showing that the eastern end of Oceanus Indica was America? Map showing the land and sea routes of the ancient Tamils.The stone heads staring at the sea, from the shores of Easter Island, tell us a lot about the ancient sailors theyÃ­re supposed to represent. Notice their Ã¬headpieces.Ã® Could they be Tamil turbans? The stone heads of Easter Island. All kinds of speculations have been made, many mystical, about the ancient sea-farers known as Wotan, Woden, the German Wuotan, the Yap Island Paathan, and the Philipine Bataan. Even today, a large tribe of Pakistanis are called Pathan. Votan was never a single person. He was really a Ã¬nation of sailors.Ã® This ancient nation of sailors and adventurers is still with us: The Dravidian Tamils! I HAVE ALSO BEEN WORKING ON THIS FOR MORE THEN 30 YEARS. AND IN THE GREAT UNIVERSAL BROTHERHOOD OF CENTRAL AND SOUTH AMERICA, OF WHICH I AM A SAT CHELA, THIS IS PART OF ARE STUDY. BUT THERE IS 1 OF MANY MISTAKES I WISH TO CORRECT- SCALPING PEOPLE WAS NOT AN AMERICAN INDIAN COSTOME. THE WHITE INVADERS HAD A MARKET FOR AMERICAN INDIAN SCALPS BACK IN EUROPE AND IT WAS BIG MONEY BACK THEN FOR MAKING WIGGS. THE INDIANS RETALIATED BY DOING THE SAME TO THE WHITE PEOPLE, AND THATS HOW IT ALL STARTED. BUT THE HISTORY BOOKS GIVE ONLY THE FALSE WHITE MAN SIDE OF IT COVERING UP THE TRUTH. 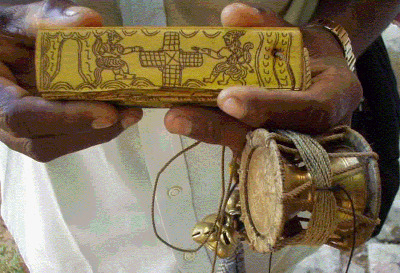 THE AZTEC CLAME TO HAVE COME FROM THE WEST AND THAT IS WHY THERE LANGUEGES ARE CLOSER TO DRAVIDIAN ONES. Great . Please share your email so if you want to write in this site , I will approve. 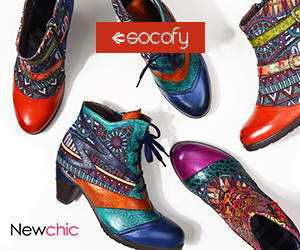 Do you live in South America ? WHERE I LIVE IN THE CARIBBEAN I HAVE FOUND 100S OF EVIDENCES LIKE THIS THAT I WILL BE WILLING TO SHARE WITH U. This entry was posted on January 20, 2016 by Sanatan Dharm and Hinduism in ancient america and vedic connection, ancient east asia and vedas, ancient egypt and hinduism, ancient egypt and vedas, ancient egypt and vedic deities, ancient egypt and vedic roots, ancient europe and vedic connection, ancient india and egypt, ancient india and mayan civilization, ancient indian science, ancient indian temples, ancient maritime, ancient navy, ancient science, ancient south america and india, ancient world and vedic connection, discovery of america, evolution, hinduism in egypt, hinduism in peru, hinduism in south america, hinduism in world, HINDUISM SCIENCE, inca, maya, vedic origin of peru, vedic past of europe, vedic roots of pre-islamic arabia and tagged ANCIENT INDIA, BHARAT, CHRISTIANITY, HINDU DHARMA, HINDUISM, HINDUISM SCRIPTURES, INDIA, VEDAS.